The Justice and Development Party and Recep Tayyip Erdogan, came to power at the end of 2002. For more than a decade, Mr. Erdogan (R.T.E.) has been ruling the country as “one man.” There is a widespread rhetoric that Turkey has been showing a miraculous level of economic development during the 10 years under R.T.E. This rhetoric is not just prominent in Turkey but elsewhere too. Is this a true statement or a myth? I would like to dissect this argument from a critical viewpoint today. Myth #1: Per capita income has increased by threefold. Wrong. The truth is that per capita income has increased by 45 percent in 10 years. The math behind the “threefold increase” is in fact a translation error caused by using the current exchange rate of the U.S. Dollar. National income and growth rates are calculated by using the country’s national currency. Whether the national currency appreciates or depreciates against the U.S. Dollar does not affect the growth rate. For example, whereas 100 Japanese Yen was equal to 0.94 Dollars on June 9, 2008, it increased to 1.32 Dollars on October 24, 2011. In other words, the Japanese Yen appreciated by 40 percent against the Dollar and the Japanese per capita GDP –which in reality did not show much increase—increased by 40 percent when calculated by using the Dollar’s current exchange rate. No Japanese Prime Minister has bragged about it, however. Wrong. 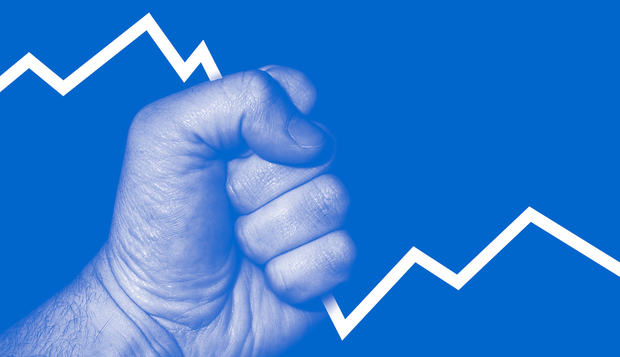 The average growth rate of the last 10 years has been 5 percent. This is roughly equal to the average growth rate of the 80 years prior to this period. Nothing has changed. Growth is fixed to five percent for three years in order to prevent the increasingly flaccid current account deficit from inducing a devaluation crisis. It did not, because it always has been. Even in 1993, Turkey was the 17th largest economy in the world with its gross national income. Sometimes it moved up along the scale one notch, sometimes it moved down. Turkey’s ranking has not changed 19 years later, in 2012. In other words, it is the world’s 17th largest economy. This will not change in the next 10 years either. This is the epitome of lying with incomplete statements. The most unsuccessful outcome of the AKP’s economic policies is the enormous increase in foreign debt. (On the other hand, this is the reason why the myth started off in the first place.) Our foreign debt has increased from 130 billion Dollars in 2002 to 337 billion in 2012. The trend continues. Our country has never incurred this much foreign debt at any point in history. The IMF debt has been cleared by borrowing funds from foreign banks as their due dates approached. This is all that there is to it. How well did the Turkish economy do over the last decade? There has been much discussion in Turkey in recent days about the performance of the economy under the AKP government, occasioned in part by an exchange I had with Minister of Finance Mehmet Şimşek. This is not a bad record of growth. An increase of 43 percent in income per capita over a decade implies an annual growth rate of 3.6 percent. This is a performance that matches that of Turkey’s previous high-growth period (1960-78) and exceeds anything experienced since. However, an important issue that is frequently overlooked is the conjunctural and comparative dimension. The last decade has been an exceptionally good one for developing countries as a whole. When Turkey’s performance is compared to the average for emerging and developing countries, it hardly looks distinguished. This can be seen from the figure below. The figure shows that Turkish performance lagged significantly behind emerging and developing economies as a group. 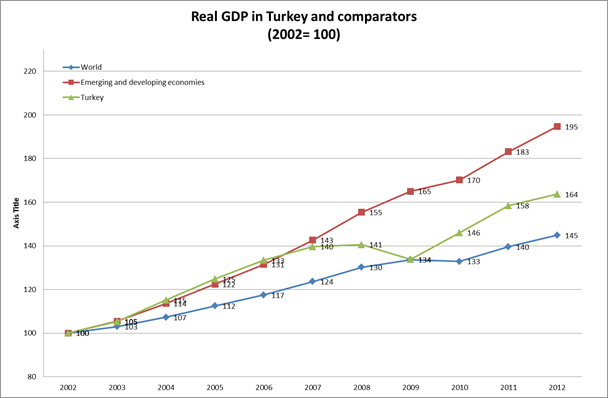 In the latter, real GDP rose by 95% compared to Turkey’s 64%. Real GDP in large emerging markets such as China, India, Bangladesh, and Indonesia all grew more rapidly than Turkey, as it did in many smaller African and Latin American countries. Bottom line: Turkey did well relative to advanced countries, and closed the income gap with them. But its performance benchmarked against the most relevant comparators, emerging and developing countries, was not distinguished. * Dani Rodrik is Professor of Social Science at the Institute for Advanced Study, Princeton, New Jersey. 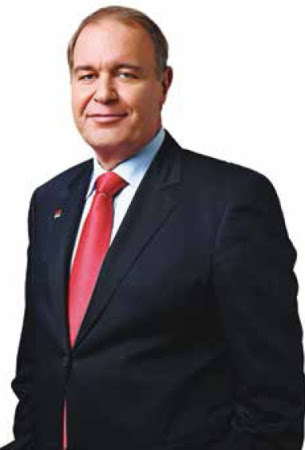 He is the author of One Economics, Many Recipes: Globalization, Institutions, and Economic Growth and, most recently, The Globalization Paradox: Democracy and the Future of the World Economy. The FT has recently published a special report, Investing in Turkey, on the challenges facing the country’s government and private sector as it struggles to gain competitiveness and deal with one of the most daunting current account deficits in the developing world. Financial Times Turkey Correspondent Daniel Dombey outlines the difficulties Turkey faces in delivering the investment needed for growth. One of the most pronounced – and worrying – economic trends in Turkey is the collapse in the country’s savings rate, a dive unequalled elsewhere in the G20. From almost 25 per cent of GDP 15 years ago, the figure today is less than 15 per cent. This has left the country heavily dependent on foreign funds for the investments the country needs. In many ways, that dependence is the central problem of the Turkish economy – particularly since the portfolio funds that keep Turkey going may be in shorter supply if, as expected, the US Federal Reserve reins in its monetary stimulus in coming months. Mehmet Simsek, Turkey’s finance minister, has an explanation for the phenomenon: it’s a response to economic stability. Remember that in the 1990s, Turkey had inflation rates of 90 per cent and above, and interest rates far higher than that. Hence Simsek’s insight: “It is only recently that Turks have seen single-digit inflation and close to single-digit interest rates… they have begun a spending spree.” He cites Turkey’s $25bn a year imports of cars and four out of five consumers’ preference for foreign models. “People think they can afford it,” he remarks. The Turkish government, by contrast, is keen to improve Turkey’s investment mix by increasing savings through pensions incentives and by attracting more foreign direct investment. But, as Andrew Finkel writes, some investors have been holding back from Turkey, less inclined to give the country the benefit of the doubt in the light of fears that autonomous institutions may be undermined by the increasingly powerful – and polarising – figure of Recep Tayyip Erdogan, prime minister. David Edgerly dives deeper into the current account deficit, which remains at about 7 per cent of GDP even though growth has come down since the peak of 2010-2011, and links it to the lack of an adequate domestic supply chain and, consequently, lower value added Turkish exports. Piotr Zalewski reports on the place of banks in Turkey’s macro picture, as the government seeks to make Istanbul a leading financial centre, but also as it uses the banking sector to manage demand – sometimes, seemingly, instead of increasing interest rates. And Leyla Boulton adds a personal note, returning to the country ten years after she left as FT correspondent and remarking on the changes of that decade. She is struck both by the achievements Erdogan has wrought – including housing and healthcare – and the alienation he has caused, even among “Turks who, a decade ago, welcomed him with open arms”. The question of whether, as she suggests, Erdogan has indeed “morphed from courageous reformer to irritable authoritarian” will have enormous bearing on Turkey’s future – economic as well as political. During the last decade in which the AKP government has been in power, the Turkish economy’s average growth rate was relatively high but not above the long run historic level. A structurally high current account deficit, excessive reliance on one time revenues, fundamental weaknesses in the social and governance domains curtail Turkey’s development prospects. The CHP puts forward a potent sustainable alternative strategy based on a coherent set of employment and environment friendly, competitive, equitable and stable high growth policy instruments. It configures a responsible regulatory framework for a corresponding dynamic market mechanism. This strategy at the same time encompasses good governance, transformation to the knowledge economy and convergence to the EU. 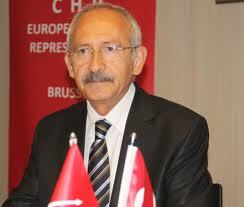 *Faik Öztrak is the CHP’s Vice President for Economic and Financial Policy and Former Undersecretary of the Treasury.